What is vitamin A and what does it do? Vitamin A is an essential fat-soluble vitamin wherein retinol is its basic molecule. Retinol is transported through the chylomicrons to the liver once absorbed, and will either be re-exported into the plasma together with retinol-binding protein for the purpose of delivering to tissue sites; or will be stored as retinol ester. It is mostly found in animal foods such as milk, fish oil, liver, and kidney; and in supplements whenever the needs are for vitamin A are not met by diet alone. Many foods, especially cereals are fortified with vitamin A.
Dietary vitamin A can be obtained from pro-vitamin A carotenoids sources from plants, such as carrots. In western countries, it is generally termed as vitamin A whilst in developing countries it often goes under the name of pro-vitamin A carotenoids. Vitamin A is also known as vitamin A retinol, which consists of four carotenoids that include beta carotene, and retinal. The vitamin plays various roles especially when it comes to retinoic acid, which is a retinol’s irreversibly oxidized form. Retinoic acid is a vital hormone-like growth factor for cells such as the epithelial cells. Vitamin A is one the essential vitamins needed by the eye’s retina in the specific metabolite form, the retinal molecule that is light-absorbing, which is essential for both scotopic vision (low light) and color vision. The retinol’s bioavailability is usually more than 80%, while the bioconversion and bioavailability of carotenes are lower. Molecular linkage, nutrition status, species, genetic factors, amount of carotene, and other interactions can greatly affect these factors. The suggested NIH vitamin A daily allowance is 3,000 IU (international units) for adult males and 2,310 IU for adult women; this increases to 2,565 IU for pregnant women and 4,300 IU for those lactating. Vision. The retina, which is located at the back of the eye, is responsible for sensing and converting the light that passed through the lens to a nerve impulse that will be interpreted by the brain. Retinol will then be transported via the circulation, into the retina and will accumulate in retinal pigment epithelial cells. The nerve impulses that was generated by the optic nerves will be carried to the brain, wherein it will be interpreted as vision. “Night blindness” occurs when there is inadequate amount of retinol available to the retina. Immunity. Due to the fact that vitamin A is essential for the immune system’s normal functioning, it is commonly referred as the anti-infective vitamin. The mucosal cells, which are the cells that line the digestive tract, airways and urinary tract, as well as the skin, functions as the body’s barrier and first line of defense against certain kinds of infection. Retinol together with its metabolites, are needed in maintaining the function and integrity of such cells. Retinoic acid (RA) and vitamin A play a major role in the differentiation and development of lymphocytes and other white blood cells, which have crucial roles in the response of the immune system. The activation of T-lymphocytes, the immune system’s major regulatory cells, appears to be in need of all the require all-trans-RA binding of RAR. Gene expression regulation. The isomers of retinoic acid (RA) serves as hormones that can greatly affect the gene expression thus, influencing several numerous physiological processes. 9-cis-RA and all-trans-RA are being transported to the cell bound nucleus to the cytoplasmic retinoic acid-binding proteins (CRABP). Specific process are being conducted wherein vitamin A, vitamin D (LINK) and thyroid hormone interact to stimulate gene transcription. A lot of the physiological effects credited to vitamin A are results of its primary role in cellular differentiation. Growth and development. Deficiency and excess intake of vitamin A can result to birth defects. Retinoic acid (RA) and retinol are vital in the development of embryos, wherein the RA functions in formation of the eyes, heart and ears, as well as in the limb development during fetal growth. Aside from that, RA was found to regulate expression of genes for growth hormone. Production of red blood cells. Like all blood cells, red blood cells are derived from the stem cells (known as precursor cells). Stem cells are highly dependent on retinoids in order to obtain normal differentiation into red blood cells. Aside from that, vitamin A is facilitating the mobilization of iron from the storage sites to the emerging red blood cells for fusion into hemoglobin, which is the red blood cells carrier of oxygen. Reduction of Acne: See here for more information. Liver, red pepper, paprika, cayenne, chili powder, sweet potatoes, carrots, dark leafy vegetables, butternut squash, dried herbs, lettuce, cantaloupe, and dried apricots are some of the foods that are highly rich in vitamin A. Unlike water-soluble vitamins that the body will store only up to a certain limited extent – with excess being excreted through urine and sweat – vitamin A is a fat-soluble vitamin. Therefore excessive amounts are difficult for the body to get rid of. This means that in people who take large enough amounts that a vitamin A overdose and vitamin A toxicity occurs. This over consumption can result in nausea, jaundice, vomiting, irritability, loss of appetite, and even hair loss. As described above vitamin A has many functions that have major health implications, it is therefore very important to get an adequate supply of it in the diet. 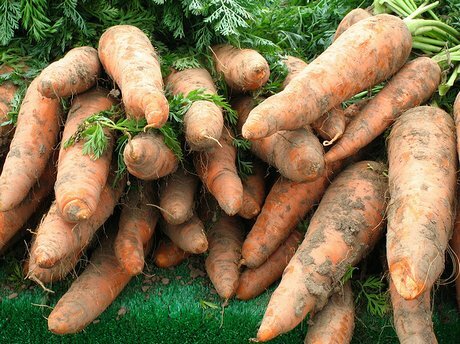 Vitamin A deficiency can result in increased viral infection and blindness. Carrot Photograph by Salim Virji. Office of Dietary Supplements; Wikipedia; VeganHealth; Medscape; Linus Pauling Institute.